Hit the waves! Wouldn't you love to run down a soft sandy beach, board in arm, and rush headlong into a wall of warm waves? Costa Rica's beaches offer some of the best surfing in the world. Surfers come from around the globe come to enjoy the outstanding, crystal blue water and frothy curls of Costa Rica. Professional tournaments are frequently held on Costa Rica's beaches, which attract masses of foreign surfers. But many Ticos also take part in the fun! Learn to surf in Costa Rica. Find a seaside resort hotel or eco-lodge and add surfing to your line up of amazing Costa Rican activities. You can learn the basics with a few quick surfing lessons. Or consider the Costa Rican surfing camps for those boarders looking for a full immersion experience. The Pacific Northwest region along the Guanacaste coast offers the best surfing in Costa Rica. Here, surfers will find the most consistent swell activity anywhere in the country. The waves are perfect for beginners and experts alike, with daily offshore winds creating long rides with easy take offs and hollow barrel sections. This coastline, along the Nicoya Peninsula, has a few break points that are easily accessible, including Avellanas, and Playa Coyote. Well-known Playa Tamarindo has a long beach break that welcomes surfers of all levels. Surfers for sea turtles. In addition to being great surfing zones, Playa Tamarindo and nearby Playa Grande are known for nesting Leatherback sea turtles—the largest and most endangered sea turtles in the world. Sea turtle programs work to help the turtles and educate the public about conservation, but eco-minded surfers are pushing to protect the habitat too, so they can continue to surf the raw waves. Experts will love to surf Witches Rock! This is perhaps the best spot Costa Rica has to offer and was made famous by the film "Endless Summer". Also known as Playa Naranjo, this legendary beach is tucked deep in near the wilderness area of Santa Rose National Park and is only a 25-minute boat ride from El Coco. Surf near San Jose, Costa Rica. The Central Pacific coast offers some popular surfing spots that are close to San Jose. Coca Barranca, Jaco, and Quepos & Manuel Antonio offer easy access and a very popular. This spots have strong beach breaks and good waves but the surf can get rough. Just south, the beaches offer good lefts and rights but frequently have riptides. Some surfers work their way down to Dominical and Drake Bay, where the scenery turns more rugged. Secluded surfing hotspots. Matapalo and Pavones on Costa Rica's South Pacific coastline offer an earthy blend of sand, sea and rainforest. Matapalo has a community of ex-pats, many lured to the area for the surfing. Although Pavones is a remote pueblo, off the beaten path, it has always been a favorite destination for surfers in-the-know. Catch the waves and the calypso vibe. The Caribbean coast attracts a fewer number foreign surfers; however, it certainly offers its share of great waves. This area also boasts the best fishing in Costa Rica. Tortuguero is great for both surfing, and turtle watching. Adventure surfers can work their way down the coast hitting the waves in Playa Bonita, Isla Uvita, Cahuita, Puerto Viejo, and Manzanillo. Puerto Viejo on the Caribbean side of Costa Rica is the perfect spot for surfers seeking a mellow ride and groovy atmosphere. Adventure travelers and avid surfers are drawn to Costa Rica's beaches in search of the exceptional curls. Join the fun! Surf Costa Rica. 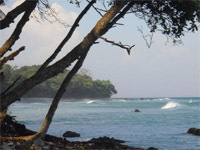 Tamarindo, in the northwest corner of Costa Rica, boasts two famous surfing locations, Witches Rock and Ollie's Point. 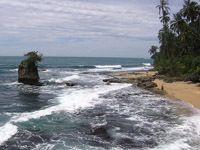 At Playa Grande, Rivermouth and Old's Man are also great locations. Jaco / Hermosa is the most popular surfing location on the centeral pacific coast and maybe for all of Coasta Rica. 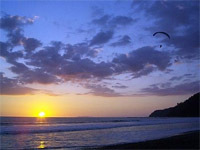 Surfing areas include Boca Barranca (great for longboarding), Caldera, Playa Jaco and Playa Hermosa. On the remote Osa Peninsula you'll find two locations that are great for surfing—Pavones and Matapalo. Manzanillo is said to offer the best surfing on the Caribbean coast of Costa Rica. Come to Costa Rica. Surf's up.